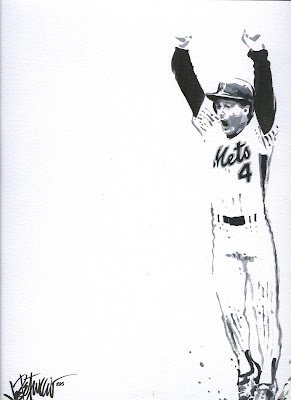 Who better than Lenny Dykstra to symbolize the heart this team is showing through all it's adversity. This is an original painting from '86. 9 X 12 acrylic om Watercolor paper. Please post any comment under this picture and be a subscriber to this blog to enter. This one is great! I'm a follower of your blog! Have been for over a year now! Thanks for hosting this giveaway! Really enjoying the blog this season! Love it Joe. Your daily drawing is one of my first stops during my morning coffee. Keep up the great work! I am currently a chemistry grad student. This season the mets have followed the similar path as me on my current studies. The best lineup of experiments get screw up by instruments failing (injuries to the players). Lineups (my results) on paper don't make sense but they still show some progress. Above that, you always find a spark to believe that someday things will be better when things works (like the incredible victory last night). You find yourself thinking that someday they will succeed and win a championship (in my case, my degree). To some extent I feel identified with the mets this season. Maybe is just because I am a mets fan! Loved nails as a met (especially in 86), but as a Jays fan had to cheer against him in 93. It all worked out though! Yes please!! Love your work. My grandfather has been a Mets fan since 1963, and he would love this! One of my favorite moments. Great job. I follow you via Google Reader, hope that counts. Even if it doesn't this is one of my favorite updates every day. Thanks. Count me in. I was watching that game on a 13" black and white TV up in the Adirondacks. The picture was barely visible but fortunately, the radio signal was clear. And Murph's call was all that was needed. A lot of Met fans had the same expression! Looking forward to the next "good old days." Nails would fit right in with this year's team. What a great painting! Lenny was such an exciting player for the Mets, back during a time that formed the basis of my fandom for this team. Big fan from Virginia. My dad and I check your blog every morning. Always an awesome way to start your day. Your artwork is amazing. LGM! This is my favorite way to follow the Mets. Keep it up! Great painting! I was on the USNS Comfort for 3 weeks this summer and the only way to keep up-to-date with the Mets was with your blog. MLB.com and NYMets.com were too slow to load. Keep it up! Nice. He looks a lot better back then than he does currently. I follow your Mets artwork daily. Thanks Joe! What a great painting Joe. I love how you always capture the true emotions of events in your work. Keep up the excellent work! L.G.M.!! This blog has helped me to be upbeat about the Mets for the first time since July of '07. Thanks! Maybe the title should be "In Happier Times." The team has been fun this season, and your blog has made the season even more enjoyable. Hey Joe, this is one of my favorite Met images of all time. 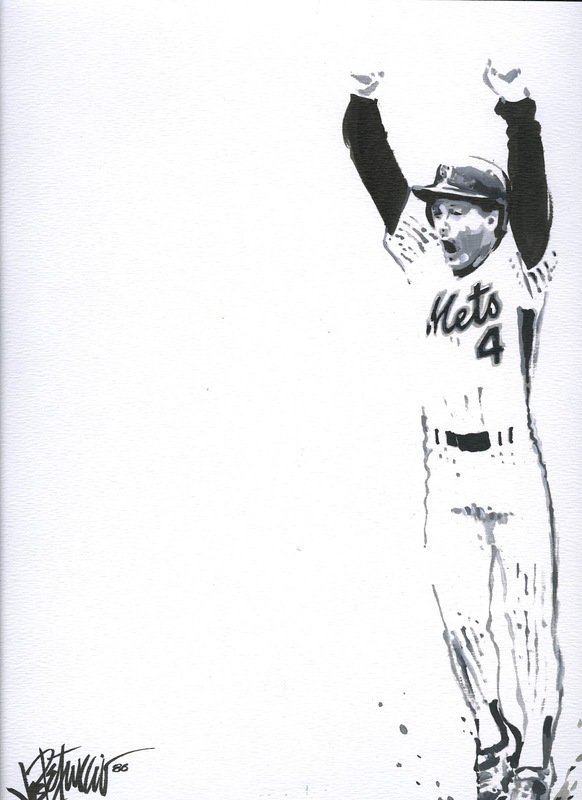 I did a drawing back in 1994 to commemorate this moment in Met history. I had Lenny sign this at a card show in Atlantic City before it was complete. Only the pencil portrait was finished at the time. I then drew the color action shots around the portrait and his signature. It's one of my favorite works. It's a shame to see the troubles Dykstra is going through these days. This moment in baseball history is one thing they can never take away from him. Or us. I'm from the city that rhymes with fun, Regina, SK, Canada. Eventhough it's nowhere near New York, I'm a huge Mets fan and I love your blog Joe. Was at game 7 in 86 with my dad the Red Sox fan. Loved those Bad Boy Mets! My Husband & I are huge Mets fans. I am never able to give my Husband a birthday gift because I am not working & this would be great for his collection. I enjoy your work immensely - you have a God given talent. They may not be going to the postseason this year, but they're a hell of a lot more fun to watch than they've been the last few years. LGM! Nails... he reminds me of some of the young players we haveon mets. I'm a big fan of your art. I look for it every day! Another Great Drawing Joe, Nails guts and hardnose play is with the 2011 TEAM!!!! aLWAYS ENJOY YOUR DRAWING JOE!!! tHANKS for spending the time to share these with all of us!!! Great work as always Joe! Joe, I'm happy to have stumbled upon your blog this season. It's been such a great season (entertaining at least) and following your daily posts has added to the richness and the tradition of the team. L . G . M!! I believe! Keep up the good work. Love checking in each day with you Joe. L.G.M.! Love your work and have been turning people onto it...and love the Mets!!! I'll never forget sitting in the car listening to 660 when Nails was traded for Juan Samuel. I was pretty young but knew it stunk! Great work, Joe! LGM! Big fan, keep uo the awesome work!! Awesome drawing, Joe! One of the most memorable HR's in N.Y. Mets history. Game 3 of the 1986 NLCS. I remember watching this game on TV and listening to it on radio. It was on ABC and it was a Saturday day game. I believe this game started at 12 or 12:30 too! Remember those days? This HR brings back memories of the late and great Bob Murphy for me. He introduced Lenny's AB by saying "The man they call nails steps up to the plate". Then smack, Game over! I'm sure Lenny and Murph are proud of the 2011 Mets resiliency and never say die attitude. I know I am! Great analogy and thanks for the memory! Remember this like it was yesterday. Hope there are moments like this not too far down the road so my sons can feel how I felt on that day. Being born in Flushing, I have been a Met's fan my whole life. I didn't get in on the Gary Carter give away (he has always been my favorite baseball player), but I'm not going to miss this one. Nails was always my second favorite. Thank you for your amazing Blog/artwork. I check it after every game, and really have enjoyed your Gary updates too. Nails! I love this picture—hope I can win it, and the Mets can win too. What a great way to remember Dykstra! Going Going Gone. A HOME RUN! Nails is a force of nature in everything he does, good or bad. Absolutely love your work Joe. Just got back from vacation and noticed this now.. hopefully you haven't announced a winner yet!